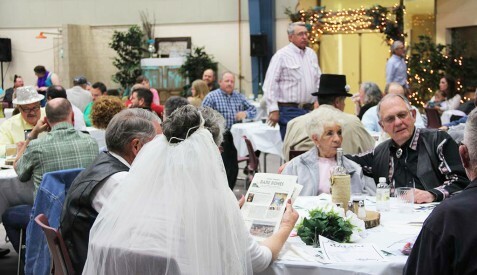 The Mesalands Community College Foundation, Inc. recently hosted their ‘Til Death Do Us Part fundraiser at the North American Wind Research and Training Center. Attendees to the event had the opportunity to watch a wedding ceremony take place and then witness a murder. Preliminary net proceeds for the Mesalands Foundation are over $6,000, which will be used to support programs that benefit Mesalands Community College and their students. James Streetman, Secretary/Clerk of the Mesalands Community College Board of Trustees and Secretary of the Mesalands Community College Foundation Board, says he thinks the fundraiser went better than expected. Nearly 200 tickets were sold to the ‘Til Death Do Us Part fundraiser. 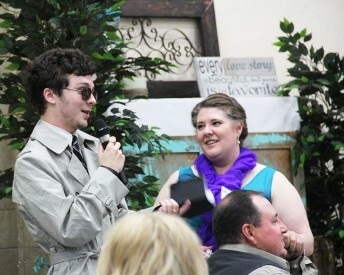 During the event, attendees enjoyed a shrimp boil dinner and traded clues, to identify the wedding murderer. There was also a live and silent auction that took place throughout the event. Attendees to the ‘Til Death Do Us Part fundraiser at the North American Wind Research and Training Center, socialize as they begin their quest to identify the murderer.